Sam Mendes' Revolutionary Road (opening today in NY/LA), is a searing, incisive thing; the best film of its kind to come along in many a year. Suburban marriage angst has become a hoary cliché in recent years, with Mendes right out there on the vanguard with his 1999 Oscar winning American Beauty. It would have been very easy for him to slip back into avenues he has already explored, but instead he goes straight for the jugular. This movie has teeth, and as much as I love American Beauty (it will remain one of my favorite films forever), I can't help but feel that Revolutionary Road might, just maybe, be a more assured and mature film. Does that mean it's going to win any Oscars? Well right now it's fighting for its life on the precursor circuit, with the Golden Globes being the only ones to have really shown it any love. The film is absolutely dripping with quality and prestige, but it never comes across as preening for awards attention. It's raw, honest, and ultimately quite bleak, perhaps too dark for the Academy in what is shaping up to strike a more hopeful tone than recent ceremonies. With Slumdog Millionaire leading the pack, it's easy to see the sense of hope that voters, and indeed audiences, may be seeking in their films. 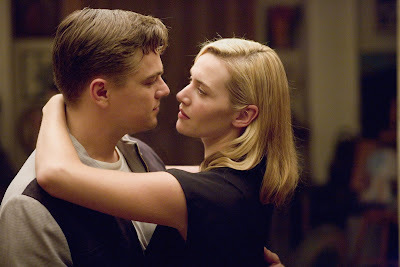 Revolutionary Road pulls none of its punches and it's absolutely riveting as a result. It's also fascinating to see Leonardo DiCaprio and Kate Winslet returning together on screen 11 years after Titanic as older, wiser, more accomplished actors, tackling deeper, more probing issues. They remind us why we fell in love with them in the first place, their chemistry is magnetic, and watching these two world class actors clash on screen is electrifying. I'm going to hold the rest of my thoughts for a full review closer to the film's local opening, but suffice it to say I was very, very impressed. I couldn't agree more, to be honest. It is one of my favourite films of the year. Of all the big Oscar contenders, this (along with "Slumdog Millionaire") is by far my favorite. It really surprises me this isn't getting any more traction. Well, Matt and Nick, I will have more to say about both of your reviews soon enough, as I will be seeing this tonite. the great enthusiasm both of you are showing has not been lost on me. Well, from what I have seen, Rev Rad is my fave too, I liked it more than Slumdog even. It is so in my top ten, I also think Slumdog is too.